I am wordy - Anyone who has spoken to me, read an email from me or god forbid a work report can attest to this fact. I was asked to write a gardening column for a new micro-magazine from Jordan Hipson and was flabbergasted! Who would read it and could I string coherent words together to be publishable? Apparently so, and this week part of the article below was included in his inaugural magazine. Thanks to my big brother Glen and Sis-in Law Ann Marie for editing. Annnnddddd - here we go. Small spaces… Let’s face it, we all have them and wow can they be a challenge. Now compound this small space dilemma with a desire to garden. What are we thinking? 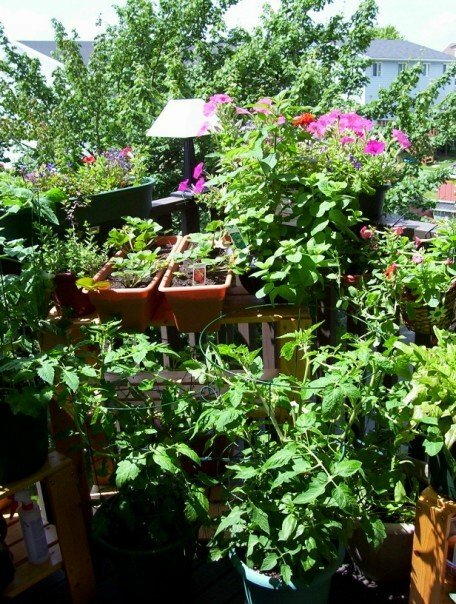 Relax everyone, glorious small space gardening is possible and can be used to our advantage. Lesson 1 – Look to your left. Look to your right. Likely you know someone who is a gardener. Risk being disowned and pester them with questions (cough, “thanks Dad”, cough). If you sweet talk them, chances are they will share supplies and clippings too! Lesson 2 – Examine your space. Is it a deck; a small patch of grass; or a window? Measure the space. This will help when you start looking for items to grow and things to grow them in. Lesson 3 – Look at your time. Time you say? I have plenty! Read these words carefully: decide how much effort you want to devote then cut it in half. Trust me. Life’s busy and gardening duties may slip down the list in favour of a jaunt to the beach. Lesson 4 – Start small. Most of us have limited time, space and money to devote to gardening. For many this is your first foray into green goodness. Remember those folks from Lesson 1 and the sweet talking? Get yakking. If you are especially charming you’ll come home with containers, plants and a story or two. Lesson 5 – Decide what you want to grow. Are you yearning for flowers, veggies or herbs? You can grow them all in a small space. Today’s garden centres are not the ones of yore and within that wacky World Wide Web ideas abound. This year I am using a canvas shoe bag* to grow herbs and pansies and hang it off my deck. Cool, cheap and easy peasy. Flowers (Wave Petunias and Pansies) in a rail planter. All vibrant colours. Carrots (Rondo) in a rail planter. These carrots are small, round and delicious. Great for shallow containers. *Available at Halifax Seed. Tomatoes (Cherry). Look at seed packets for the word “determinate”. Determinate usually means a smaller sized plant. Most seed packets will say the width and height of the plant. Take that into account when you you choose. Herbs (Oregano, Thyme, Basil). A small container is all you need. Potatoes (yes, you read it correctly). I had an old bucket and painted the outside. I tossed in some soil and a couple of seed potatoes and in October there were beautiful baby potatoes. The link here is to my page on how to start bucket potatoes. No injuries reported except for the potatoes. Peppers (Red Sweet). 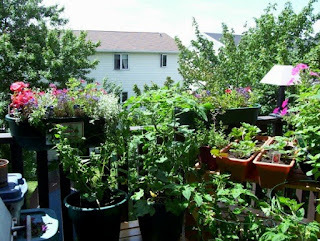 Choose ones whose plant size is less than 4 ft.
Two planters on the deck railing, three veggie containers sat on the deck and my herbs were my bistro table centerpiece. Lots of growing for a small amount of real estate. 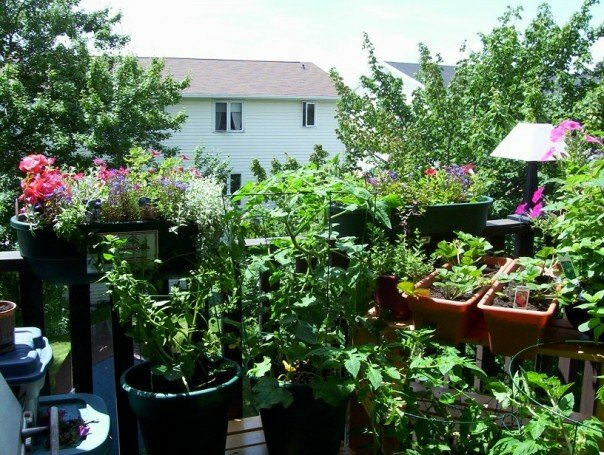 There are reams of ideas, plants and projects available to the small space gardener. Play in the dirt, experiment with growing, visit a local reputable garden centre and ask questions. Don’t let space limit your garden oasis potential. Ok, Ok... I will admit that in year two while living in the condo, I went a bit bejonkers. Evidence as seen below. Strawberries, more tomatoes, more flowers etc. I am always experimenting. I would be remiss if I didn't thank those who have (and those who continue to) selflessly shared their love of gardening and knowledge with me. For that, I will always be grateful.